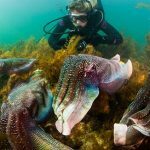 The revival of the Giant Australian Cuttlefish in South Australian waters is continuing with the number of the bizarre creatures counted during this year’s breeding season increasing by 20 per cent. Each year more than 100,000 of the colourful cuttlefish gather in South Australia’s Upper Spencer Gulf Marine Park in what is the only known mass aggregation of its kind in the world. Favourable conditions and a series of law changes, such as fishing bans, have helped the cuttlefish recover in recent years from 13,000 in 2013 to 124,000 in 2017. The 2018 survey results, released today, showed their abundance had increased to 150,408 this year, which is approaching the high numbers recorded when counting began in the late 1990s. The annual cuttlefish count was completed by the South Australian Research and Development Institute (SARDI). 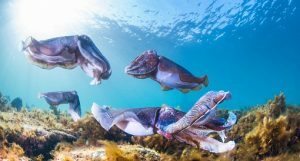 Senior Research Scientist at SARDI Dr Mike Steer said the 2018 survey results showed the cuttlefish population’s remarkable capacity to rebound from the low levels recorded five years ago to more than 150,000. “This is only 17 per cent less than the peak estimate of 182,585 individuals in 1999,” Dr Steer said. In July 2012, a working group was established to coordinate a response to concerns about the decline in population, with subsequent protection of Giant Australian Cuttlefish commencing in March 2013. About a third of the 8km strip of rocky reef where the cuttlefish lay their eggs has been a marine park sanctuary since 2014. The reef is at Point Lowly in the Spencer Gulf, some 20km east of Whyalla and almost 400km from the South Australian capital Adelaide. The Spencer Gulf region of South Australia is known for its pristine waters and premium seafood including prawns, oysters, tuna and kingfish. Nicknamed “the rock stars of the ocean” because they live fast and die young, cuttlefish have a life span of just 12-18 months. This makes each May to August breeding season critical because the number of surviving eggs one year directly impacts the number of adult cuttlefish that return the next year to breed. Like octopus and squid, cuttlefish are cephalopods. Giant Australian Cuttlefish, Sepia apama, are found all along the southern Australian coast in waters off of Western Australia, South Australia, Victoria and New South Wales. The cuttlefish also have chameleon-like skin cells called chromatophores, which allow them to change the colour and texture of their skin within a second from blues to greens to purples and black to help them hide from predators, ambush prey and attract a mate. These courting rituals include “dance battles” between rival males while smaller “cross-dressing” cuttlefish disguise as females to steal a mate from larger suitors. The massive aggregation and strange behaviours have attracted visitors and media from around Australia and the globe. The inaugural CuttleFest was held in July to raise awareness about the creatures, giving hundreds of novice and experienced divers the opportunity to get in the water for a close encounter. Dr Steer said he was pleased the cuttlefish where attracting tourists to the area. “It’s also great that there is increased tourism interest in the cuttlefish at Point Lowly with visitors respecting the ‘look-but-don’t-touch’ protocols to ensure the cuttlefish are not disturbed while they are breeding,” he said.